Qualified Appraisers and Qualified Appraisals provides clarification on complex IRS guidelines, and offers solutions and insight that can help appraisers adhere to the latest Treasury Regulations concerning appraisals submitted in tax matters. From the Uniform Standards of Professional Appraisal Practice to IRS regulations, this book explores the body of law that has arisen around the production of “qualified appraisals” that the government and courts will accept. The discussion covers estate, gift, charitable contribution, income taxes, and more, with expert guidance on the interpretation and application of complex regulations. As appraisers often are called upon to provide expert testimony in court, this book shares effective methods including the novel “hot-tubbing” technique that eliminates the appearance of bias in favor of a less-adversarial discussion. Cases are dissected as they relate to application of existing appraisal laws, and the companion website features checklists, references, and additional cases as they become available. The IRS regulations on qualified appraisers and qualified appraisals have sparked a storm of controversy, and have raised more questions than they have answered. 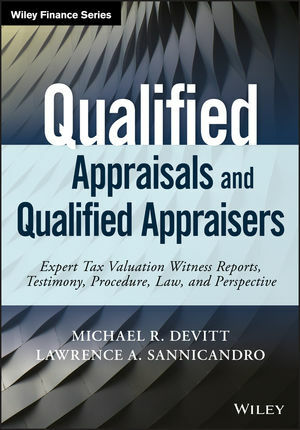 This book acknowledges the problems and offers solutions to help appraisers produce work the IRS and courts will accept. In order for an appraisal to satisfy the government, an appraisal must be performed by a “qualified appraiser” specific for the type of property in question. This broad statement leaves much to question, but Qualified Appraisers and Qualified Appraisals provides the answers appraisers need to comply with the law and produce work that meets the latest standards. MICHAEL R. DEVITT, CPA, JD, MS, is Professor-in-Residence at the University of San Diego Law School. He was managing partner of a law firm where he practiced complex civil litigation in various jurisdictions around the U.S. and lead counsel in several high-profile cases dealing with fraudulent financial reporting, which have resulted in hundreds of millions of dollars in combined recoveries. He is a frequent lecturer on evidence, financial reporting, accounting, litigation, ethics and other topics. LAWRENCE A. SANNICANDRO, LLM, JD, MBA, is a tax controversy and litigation attorney with McCarter & English, LLP. He regularly represents clients in audits before the IRS Office of Appeals, and in litigation before the United States Courts of Appeals, the United States Tax Court, the United States Court of Federal Claims, and United States District Courts. Prior to entering private practice, Mr. Sannicandro served as a law clerk for the United States Tax Court, and before that, as an attorney for the IRS. Mr. Sannicandro has written extensively on tax practice and procedure.